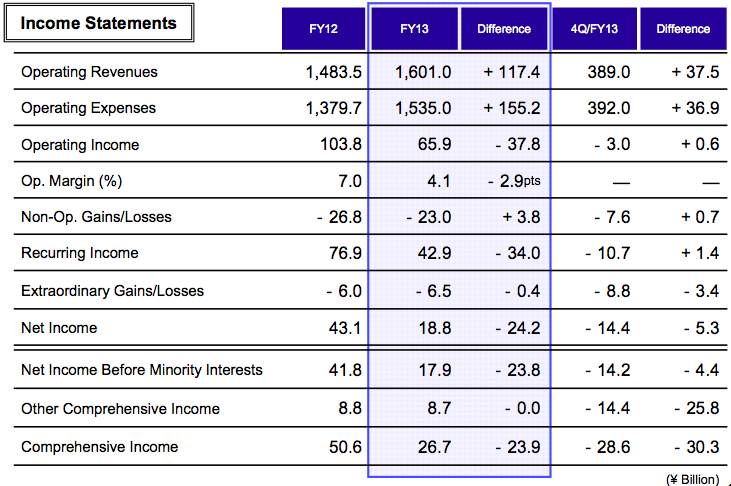 All Nippon Airways' FY2013 profit was always going to be disappointing compared to rival Japan Airlines, which gained efficiencies (unfairly, in ANA's view) during its bankruptcy restructuring. 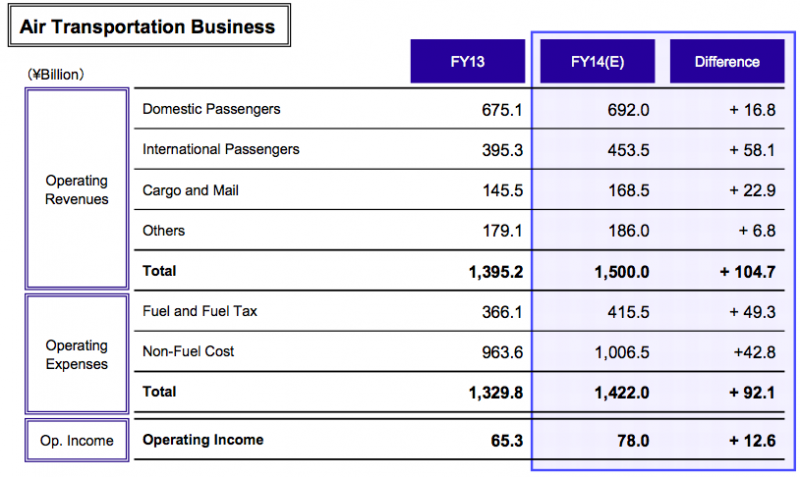 This held true with ANA delivering half the operating margin of JAL. But aside from this comparison and looking at ANA on its own, Japan's largest carrier by revenue and capacity is managing well. Costs excluding fuel rose in line with capacity growth, although not evenly, giving cause for some worry. ANA is more bullish than JAL on the future, planning higher growth, to be realised with its recent daytime Tokyo Haneda slots and aircraft orders. ANA expects an improvement in FY2014 even though international expansion during the year will dent load factor, unit revenue and yield. There will be room in the future for optimisation, which ANA plans for its domestic network in 2014 as it carries more passengers on lower capacity, boosting load factor. 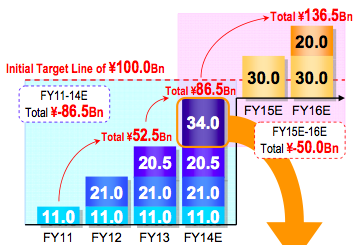 FY2013 was a record year for ANA, earning JPY1.6 trillion (USD15.7 billion) in revenue, more than any other year in its history. 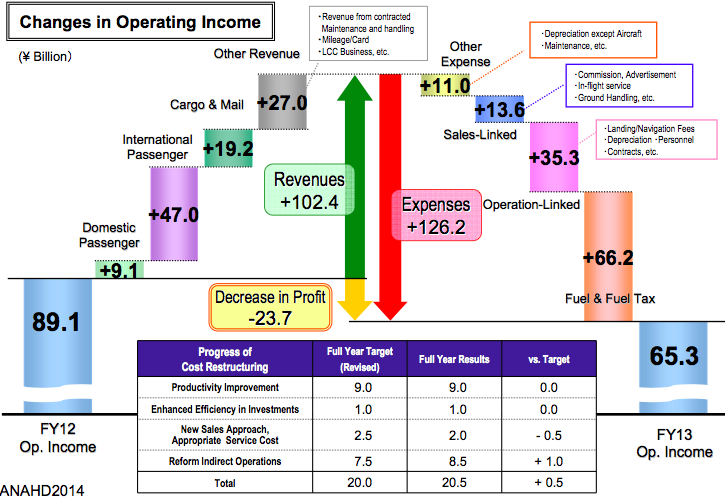 But operating profit fell as costs, notably fuel, increased. ANA's operating margin decreased to 4.1%, low for it and Japanese standards, but not poor performance on a global scale. Revenue growth in the air transport segment, ANA's largest by far, was concentrated in international operations – a theme that will continue into the future. 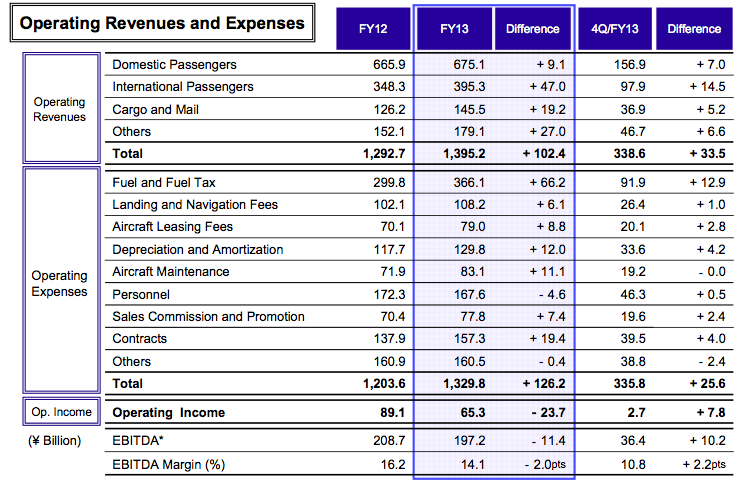 ANA's increased revenue however was not able to offset the increase in expenses. Fuel costs increased by about JPY66 billion (USD650 million), but ANA also recorded a similar increase in expenses in various other areas. 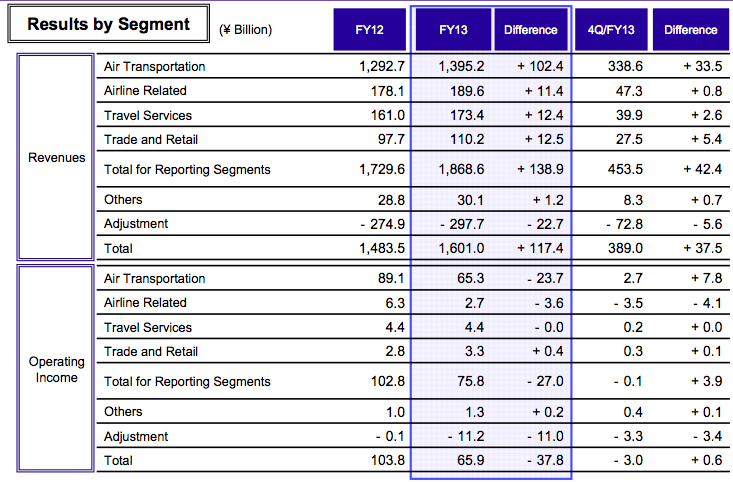 Overall ANA's non-fuel costs rose by 6.6% in FY2013, slightly ahead of 6.2% ASK growth. CASK including fuel grew 10.5%. Cost increases were not even. Landing and navigation charges grew by 5.9%, less than ASK growth and despite these being impacted by foreign exchange. Leasing costs were up 12.6%, depreciation and amortisation 10.2%, maintenance 15.5% and sales 10.5%. Staff costs were down 2.7%. FY2013 brought an unwelcome increase to CASK, erasing two years of decreases. ANA expects a moderate drop in FY2014 CASK and a more noticeable drop in FY2014's ex-fuel CASK. By the end of FY2014 ANA will have taken out JPY86.5 billion (USD850 million) of costs, with a further JPY50 billion (USD490 million) reduction planned by the end of FY2016. In total this is JPY36.5 billion (USD358 million) more than the JPY100 billion (USD984 million) ANA forecast to be reduced by FY2016. Cost savings so far have focused on productive and operational efficiency. Although ANA's overall FY2013 performance was weak, ANA is optimistic FY2014 will be kinder. ANA was hit in 1H2013 with ongoing 787 problems and weakened demand from China, impacting profit. These challenges moved out of focus and ANA in 2H2013 saw better performance than 1H2013, leading the carrier to believe it can continue the momentum in FY2014. ANA expects stronger performance as it grows internationally. Leading the charge with international development is the Tokyo Haneda slot pool (larger than JAL's) it received for daytime international services. ANA is using the new Haneda slots mostly to replace existing Narita services while also adding some entirely new flights, mainly within Asia. ANA expects to receive a higher yield for Haneda flights than Narita flights. The additional services, and more to come, are part of ANA's strategy to shift its capacity exposure from the domestic market to international. 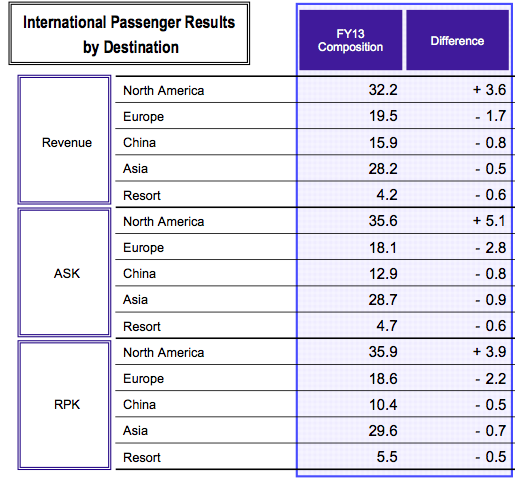 ANA is growing international seats at Tokyo (Haneda and Narita) by 23% for European routes in 1Q2014 and 44% for Asian routes. ANA's international network developments in recent years have been bent towards the North American market as it launched new services and grew on existing ones in partnership with JV partner United Airlines. But the short term should see more developments in Europe as ANA grows its position there as well as in Asia, although sector lengths to Asian points are shorter (but sometimes higher yielding). European routes are covered by a JV with the Lufthansa Group of airlines. ANA's next strategic objective is to increase North America-Asia traffic via Tokyo Narita, which should entail further North American growth. 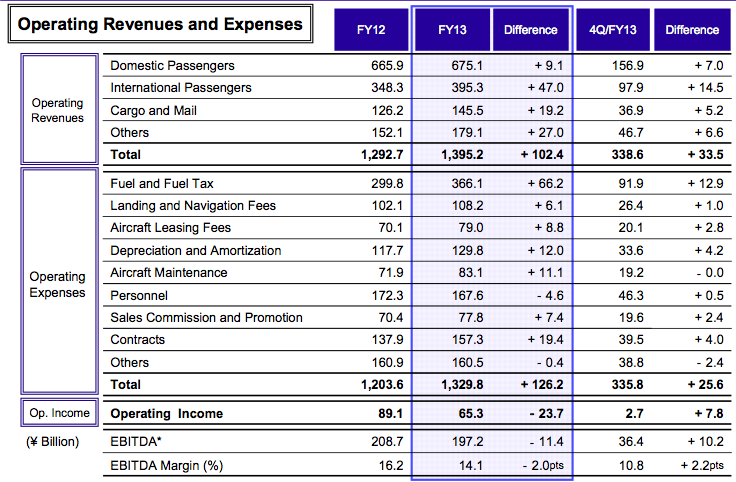 ANA expects domestic revenue to increase by a modest 2.5% in FY2014, but on the back of a 0.8% decrease in ASKs, permitting a slight 0.8ppt increase in domestic load factor. International however will generate a 14% increase in revenue. However, this will come at the expense of load factor, unit revenue and yield. ANA expects international load factor to decrease 2.1ppt to 71.8%, unit revenue to decrease by 3.4% and yield by 0.6%. While there are falls, they are from high levels, providing some cushion. Gains can be made as ANA settles in to the new routes. As the load factor indicates, there is considerable room for improvement by international standards. ANA expects its growth combined with cost savings to boost its operating margin to 5.0% in FY2014, an increase from FY2013's 4.1% (estimated in Mar-2014 to be 3.8%). 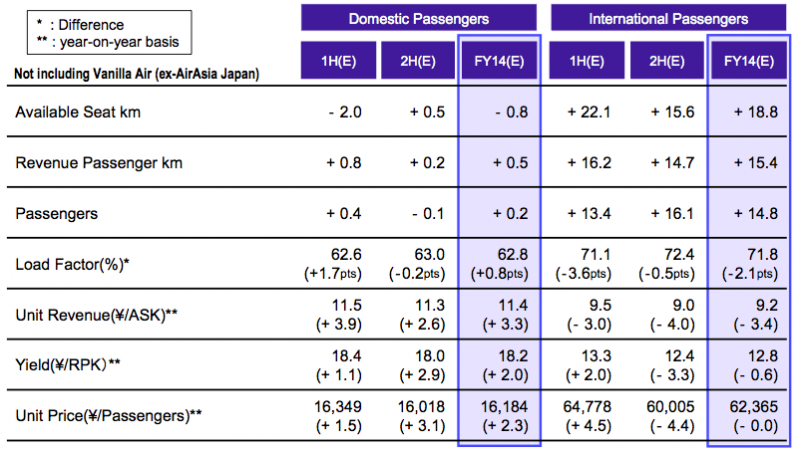 Beyond FY2014 ANA expects successive increases in operating margin, ultimately rising to 7.0% in FY2016 – a handsome figure for an airline, but still lower than JAL's projection of double digit operating margins. 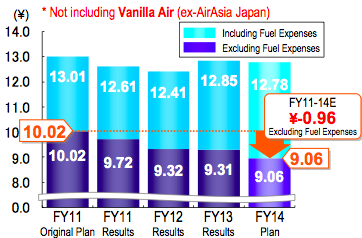 ANA, including Vanilla Air, at 31-Mar-2014 had 231 aircraft, an increase of only one aircraft from FY2012's 230. But there were considerable movements within the fleet as four domestic 747-400s and older 767s and A320s were retired. 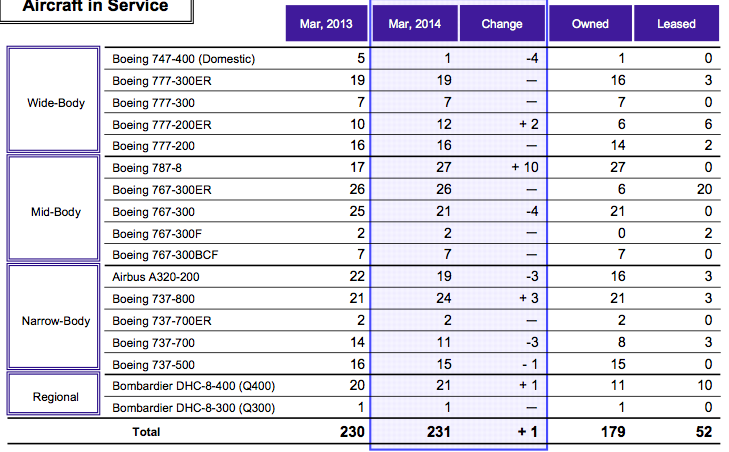 ANA took more efficient 777-200ER, 787-8s and 737-800s and a Q400. The year's developments are in line with ANA's broader objective of increasing its fleet efficiency. ANA wants 75% of its fleet to be what it terms "fuel efficient" by the end of FY2020, up from 51% at FY2013. 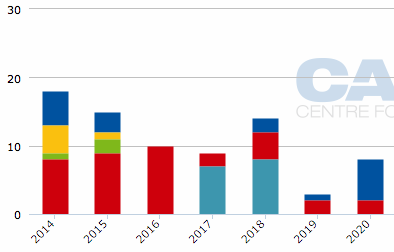 While ANA in Mar-2014 placed a large aircraft order, this had considerable retirements built in. 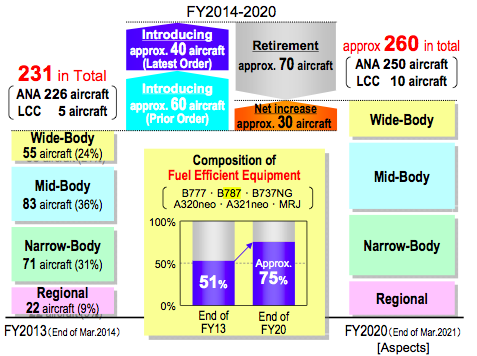 ANA expects its FY2020 fleet to be about 260 aircraft, up by only 29 aircraft from FY2013's 231. The largest growth will be in mid-size aircraft, such as the 787. ANA in summer 2014 should receive its first 787-9, a stretched variant of the -8s it already operates. Air New Zealand will be the first to take delivery of a -9, but depending on Air NZ's introduction and certification programme, ANA may be the first to have passenger flights on the -9. It is inevitable that ANA in the short term can surpass the financial performance of JAL, once the immediate benefits of the post-bankruptcy restructuring wash through. ANA will certainly try its best to narrow the gap with JAL, and absent that will gain in network and size what JAL appears to be approaching more conservatively. ANA plans to improve its efficiency, but a concern still remains that large expansion brings exposure to whatever crisis aviation has to deal with next. In expanstionary mode, ANA has less room for error than JAL.